BITTEN BY A HELLCAT wasn’t purrfect, but sometimes a belly rub is all you need. Was this review helpful? Please consider liking it on GoodReads or voting for it on Amazon! Kissed by a Dark Prince is on my TBR pile, and I can’t wait to get started on this series. 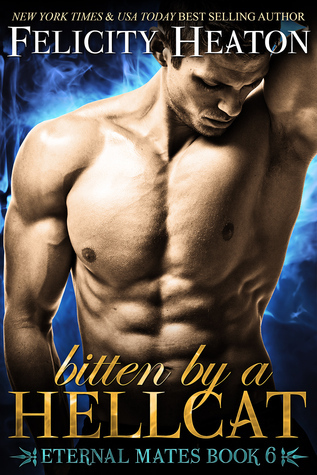 Even though Bitten by a Hellcat got off to a shaky start, it sounds like Owen and Cait worked things out in the end, and that this book does a good job of setting the reader up for the next installment. Looking forward to reading Felicity’s shifters. Great review. My dogs can both vouch for that last statement. LMAO! Glad this picked up after those initial shaky chapters. Novellas can be so hard sometimes because the author can only do some much within a short amount of time. Nice review Carmel and I hope you have a great weekend! The novella that was released before this one knocked my socks off, so unfortunately I had back-to-back examples how they can be both really good, and kinda meh. Ditto on the dragons! I actually just wrote my review for book 7 earlier today, and I LOVED IT! Someday I will read one of her books… maybe one of these because… Cats. Cats are so damn picky while as dogs just so long as you are petting them they are in heaven. I agree! Novellas are great for mini side adventures, but not so much for character debuts. Two tails?? You know I can’t resist this series, so I’ll just go into this one with a tad more patience for the initial hookup. Felicity always in the end pulls it off. That Dragon has been tempting me though every time I spy him, Lol. There are a few dragon teasers in this novel which makes it a must read before you progress to the installment that everyone’s been waiting for. Hmmm, sounds like this wasn’t exactly your fave from this series, so depending on how hooked on these I get once I start reading them I might end up skipping it… Great review Carmel! Pili recently posted…Friday Reads: Ensnared by A. G. Howard!!! You could possibly jump over this one without suffering any ill effects, but it’s only 163 pages, so it’s over quickly anyway. Bump uglies? lol I think that might be the first time I’ve heard that term. I think I might have to put this series in my wishlist. I do like those covers. I’m pleased to see this one picked up for you after the shaky start Carmel, I haven’t heard of this series or author but it sounds interesting! It is difficult when an author introduces new characters in a novella, I find there isn’t enough page time to fully develop or appreciate them (for me). Loved this -> BITTEN BY A HELLCAT wasn’t purrfect, but sometimes a belly rub is all you need. This was the first so-so installment which is a darned good track record if you ask me! I’m not a cat person, so I’m relieved that my last sentence had the desired impact. Hehe! Zombies will have that effect on ya. LOL! It’s a challenge to avoid insta-love, especially in a series that’s all about finding ‘the one’ and the minimal page count doesn’t help. “Couples that kill together, say together” LOL. Hard to get a strong story across in a novella. It can be done…but it’s a challenge. That’s a great motto, don’t ya think? Maybe not so much in RL, but in fiction it totally works! Owen can touch me anywhere he likes! Man, I need to hurry up and catch up with these. I enjoyed book 4, but didn’t love it as much as the first three, so I think that slowed me down. But I’m super anxious to get to the dragon 😛 I’m excited about the mortal hero too, that’s a fun twist!